Nagios can process commands from external applications (including the CGIs) and alter various aspects of its monitoring functions based on the commands it receives. External applications can submit commands by writing to the command file, which is periodically processed by the Nagios daemon. Enable external command checking with the check_external_commands option. Set the frequency of command checks with the command_check_interval option. Specify the location of the command file with the command_file option. Setup proper permissions on the directory containing the external command file, as described in the Quickstart Installation Guides for Fedora, OpenSuse or Ubuntu. When Does Nagios Check For External Commands? Immediately after event handlers are executed. This is in addtion to the regular cycle of external command checks and is done to provide immediate action if an event handler submits commands to Nagios. External commands can be used to accomplish a variety of things while Nagios is running. Example of what can be done include temporarily disabling notifications for services and hosts, temporarily disabling service checks, forcing immediate service checks, adding comments to hosts and services, etc. 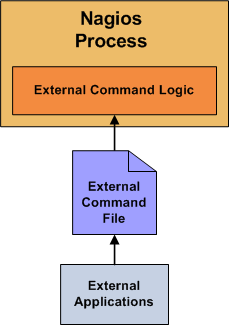 ...where time is the time (in time_t format) that the external application submitted the external command to the command file. The values for the command_id and command_arguments arguments will depend on what command is being submitted to Nagios. Warning:  Passive check result was received for service 'check_trap_test' on host 'testserver', but the host could not be found!